Ureteropelvic junction obstruction is the most common pediatric obstructive uropathy. Retroperitoneal laparoscopic-assisted dismembered pyeloplasty (OTAP) combines the advantages of a retroperitoneal approach with the high success rate of the open technique. A modification of the OTAP, using a posterior muscle-sparing incision to approach the kidney, is described. With the patient placed in prone position, a transverse 15-mm-long skin incision is made. A 12-mm balloon Hasson trocar with operative telescope is inserted after the Gerota’s fascia has been opened. The ureteropelvic junction is exteriorized and a traditional dismembered pyeloplasty is performed. The posterior approach allows a quick and easy access to the renal lodge and does not require the incision of abdominal wall muscles and the parietal peritoneum does not interfere with the procedure. Furthermore, the exteriorization of the ureteropelvic junction is easy, because the space between its natural position and the skin is short, consisting only in subcutaneous tissue. The posterior modified approach to the kidney for OTAP procedure is a good option, as an alternative to lumbotomic lateral access, allowing a good visualization of the kidney lodge, together with easy and rapid exteriorization of the ureteropelvic junction. The ureteropelvic junction (UPJ) obstruction is the most common obstructing uropathy causing hydronephrosis in children, with an incidence of 10–30% in patients diagnosed during infancy. The variation in the etiology of the obstruction has led to an evolution of repairs to correct the stricture and restore or preserve renal function . The standard Anderson–Hynes pyeloplasty is still the gold standard for surgical treatment, with a long-term success rate exceeding 90% . Laparoscopic and retroperitoneoscopic approaches have been proposed as alternatives, to reduce postoperative hospitalization, pain, and scars . 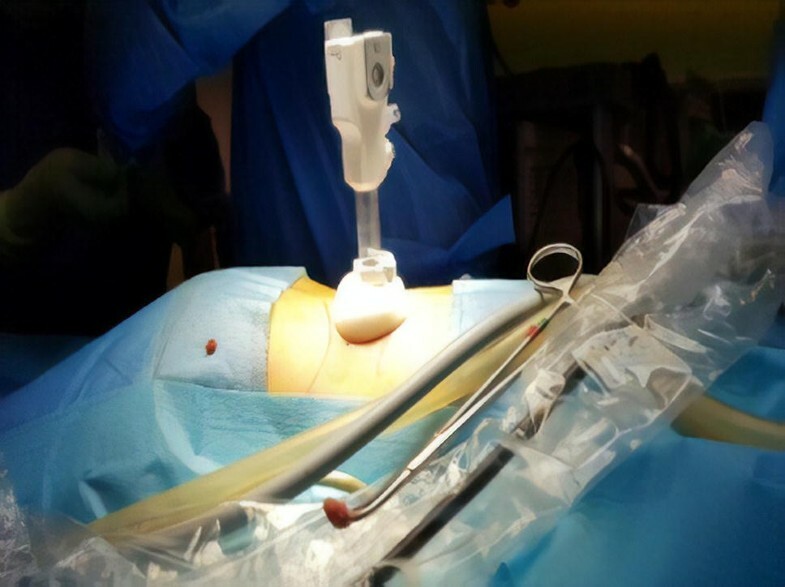 However, the potential advantages of these techniques remain controversial and concerns have been expressed about the risk of abdominal injuries in the laparoscopic approach, the small operative space, and technical difficulties for retroperitoneoscopy . In 2007, Lima et al. described the One-Trocar-Assisted Pyeloplasty (OTAP), a technique which is a technique combining the advantages of a minimally invasive approach with the high success rate of the open dismembered pyeloplasty . 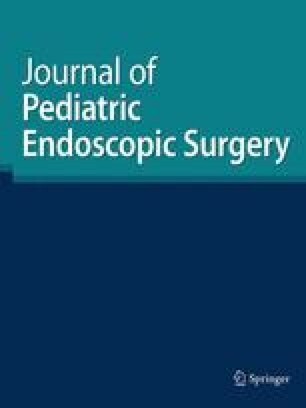 In this article, a modified approach for OTAP, using a posterior incision to reach the renal lodge in children less than 1 year of age, is described. Under general anesthesia, the patient is placed in prone position, with pelvic and chest support, allowing the lumbar triangle to lie unsupported, to enlarge the retroperitoneal working space (Fig. 1). A 15-mm-long transverse skin incision is made, where the line running from the tip of the XII rib and the spine crosses the lateral margin of the sacrospinalis muscle (Fig. 2). The dissection of subcutis allows the exposure of latissimus dorsi fascia, which is incised. After medial retraction of the sacrospinalis muscle, the kidney lodge is exposed with blunt dissection of the perirenal fat. A 12-mm balloon anchorage trocar and a 10-mm telescope with a 5-mm coaxial operative channel (Karl Storz) is inserted and the retroperitoneal working space is created by moving the telescope (Fig. 3). The insufflation pressure is 8 mmHg and the flow rate of CO2 is 0.5 l/min. The surgeon stands on the affected side of the patient and the monitor is placed in front of him at the contralateral side. The assistant stands in front of the surgeon. The first step of the procedure is to identify the UPJ, which is approached posteriorly. Dissection is accomplished using a 5-mm endo dissector. Once the lower renal pole is identified, the pelvis and the proximal ureter are isolated and exteriorized at skin level. A 5–0 stay suture is placed on the pelvis and on the proximal ureter, to maintain the correct anatomical relationship of the structures (Fig. 4). If required, the pelvis can be emptied by puncture. Once the UPJ has been exteriorized, a traditional dismembered pyeloplasty is performed, as in the open technique, using 6–0 absorbable suture (PDS). A trans-anastomotic uretero-pyelo-nephrostomy pig-tail stent is inserted to the bladder before the anastomosis has been completed. After checking the anastomosis, the pelvis is put back in the retroperitoneal space. In case of extrinsic obstruction due to crossing vessels, the vessels are decrossed before completing the anastomosis. 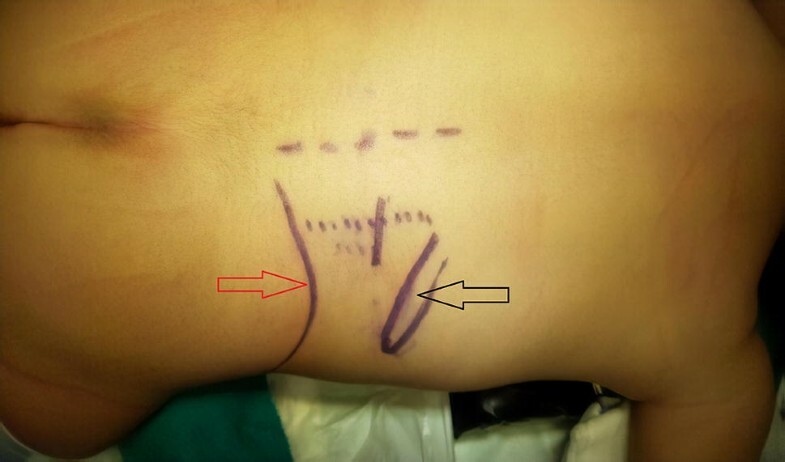 At the end of the procedure, a Penrose perinephric drain is placed, the fascia of latissimus dorsi is closed, and intradermal running suture is accomplished without any subcuticular suture. A Foley catheter is left in place for 48 h.
The patient can be fed on the same day, the stent is removed 5 days later, and the Penrose drain is on postoperative day 7. Several techniques for pyeloplasty have been reported since 1939 when Foley described the Y–V technique. However, the Anderson-Hynes dismembered pyeleoplasty has soon become the “gold standard” treatment for UPJ obstruction, with overall success rates ranging from 93 to 99% and it can be performed using several surgical approaches. The standard open approach is the muscle-cutting anterolateral flank incision, which has the disadvantages of postoperative pain and a poor cosmetically appealing scar. Anterior muscle-splitting incisions are more time-consuming, with reduced access to the kidney. Minimally invasive techniques have been applied to the original open approach since 1993 in adults and 1999 in pediatric patients, using either the transperitoneal or retroperitoneal approach and, more recently, robotic surgery. Both laparoscopic approaches have shown the same success rate as the open surgery, significantly reduced morbidity and complications, with a shorter hospitalization time, less pain, and more cosmetic scars. However, the operating time is significantly longer if compared to open approach, mainly because intracorporeal suturing is challenging and time-consuming in children, due to limited working space . Besides, the retroperitoneal approach is reported to be exceedingly challenging in patients less than 6 kg of weight and is usually contraindicated in patients who have undergone other retroperitoneal surgery or percutaneous nephrostomy . In 2007, Lima et al. 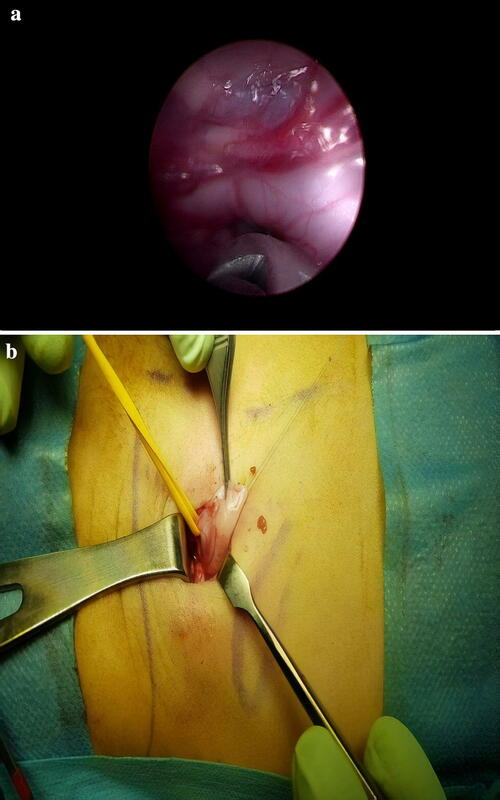 described a hybrid technique, the One-Trocar-Assisted Pyeloplasty (OTAP), a video-assisted procedure consisting of retroperitoneal laparoscopic mobilization of the obstructed UPJ by a single operative trocar, followed by extracorporeal dismembered pyeloplasty. In the OTAP series reported by Lima the average operative time was 139 min, the success rate 87.5% and conversion to open repair was required in 7 cases, 5 of which because the peritoneum was accidentally opened; in the remaining 2 patients, a correct view of the pelvis was impossible to obtain, and the surgeon decided to enlarge the skin incision, to facilitate the extraction procedure . The high conversion rate reported by Lima (8%) is mainly due to accidental peritoneal tears, also recognized as a frequent complication in other series with a lateral retroperitoneal approach. Actually, in the lateral position, the trocar incision is very close to the lateral peritoneal reflection. Furthermore, the renal lodge is reached through a long, deep and narrow channel, which crosses the large abdominal muscle layers. The posterior approach to the kidney was described by Gustav Simon in 1870  and later reported by other authors, who used posterior lumbotomy to perform pyeloplasty, partial and total nephroureterectomy, pyelolithotomy, ureterolithotomy, and renal exploration with cyst marsupialization in children [10, 11, 12, 13]. Transverse dorsal lumbotomy provides an excellent direct exposure to the UPJ and it is easily performed especially in infants, due to the less-developed posterior musculature; it implies minimal tissue damage, since it does not involve muscle cutting, therefore, resulting in low postoperative pain, early recovery, short hospitalization, and a relatively small posterior scar. For these reasons, we decided to approach the kidney using a posterior incision just lateral to the sacrospinous muscle, to perform the OTAP procedure. Unlike the standard flank incision, the posterior approach is a muscle-sparing approach that allows a rapid exposure of the kidney and the tissue’s thickness that the ureteropelvic junction has to cross is less than in conventional flank incision, represented by only the subcutaneous fat. Borzi in 2001 published a comparative randomized controlled study comparing the posterior and lateral retroperitoneoscopic approach for nephroureterectomy in children, showing no difference in operative duration but a higher conversion rate in the lateral approach. He concluded that the posterior approach gives easy and quick access to the renal pelvis without the risk of damaging the peritoneum . With no operative mobilization of the peritoneum, the oral intake can be performed the same day of surgery. Our preliminary experience with posterior one-trocar-assisted pyeloplasty shows that this technique combines the advantages of posterior lumbotomy (i.e., early realimentation and enhanced cosmesis) with the benefits of OTAP (i.e., small incision with subsequent negligible postoperative pain and short operative time). The posterior modified approach to the kidney for OTAP procedure (P-OTAP) is a worthy alternative to the standard flank incision, allowing a good visualization of the kidney lodge and an easy and quick exteriorization of the ureteropelvic junction for dismembered pyeloplasty with a better postoperative recovery.